A cosmopolitan food culture mingles beautifully with traditional, simple recipes. This city speaks of some of the best eateries, restaurants, and cafes. A rise in steady population inflow has resulted in a myriad of variety in food menus – starting from authentic delicacies from Coorg, Kerala, North India, to our eastern states. The diverse options also include Arabian cuisines such as the delicious Alfaham or Falafel, continental dishes, and European breakfast items. Amidst the chaos and availability of so many choices, Bengaluru has also witnessed a rise in several talented and ambitious chefs – each of them striving to be master in their own area of specialisation. With continual zeal, energy, and dedication, these dynamic artists surely look promising in their venture to bring about a revolution in the Bengaluru food scene. Today, let us take you through another chapter on SaleBhai Indian chef chronicles – where we will introduce you to 10 of the top upcoming chefs in Bangalore. Have you ever tried the signature Moussaka and New York cheesecake from Marzipan Cafe and Bakery, Ulsoor? If not, we suggest you keep these items in your bucket list. Owned by chef Kiki Petriti, this eatery is known for its Greek specialties such as stellar cheesecakes, fresh salads, refreshing juices, and delicious pies. Originally from Greece, Petriti was a writer by profession and had completed her masters from UCLA. Baking came naturally to her since she also worked in a Greek restaurant, helping bake items for her family and friends. An avid food lover, her hobbies include taking frequent holidays with her husband to enjoy small breaks away from the daily humdrum. Thefounding director and chef of Avant Garde Hospitality (that owns and operates restaurants Caperberry and Fava in Bengaluru) – is a seasoned expert in classical and contemporary European cuisines and regional Indian dishes. 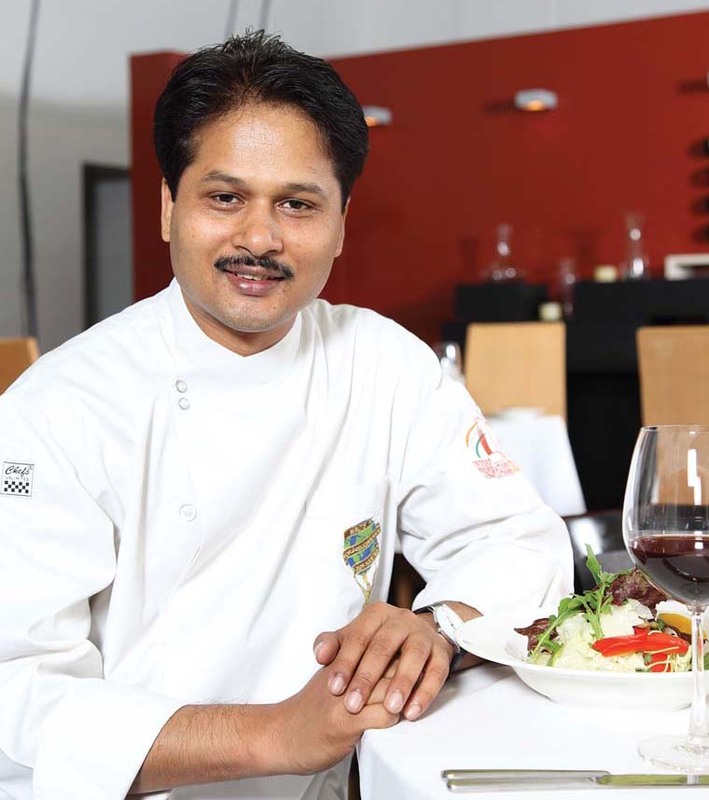 The talented chef – with a diverse experience of around 24 years – had been bestowed with the ‘Best Chef of India’ title at the Indian Restaurant Congress and Awards, 2013. He was also invited by the Culinary Institute of America as a guest chef and speaker at The World of Flavours Conference – held during 2004, 2005, and 2007. This winner of several accolades – that includes ‘IFCA Entrepreneur Chef of the Year’ Award 2008-2009 and the SICA ‘Golden Hat’ Award 2010 – is a fan of fine wines, F1 racing, travel, photography, architecture, and design. In his own words at an interview with The Telegraph: “I love Bengali food, because that’s where I’m the most Bengali. I’ve not lived in Bengal for almost 30 years but I can say that when I eat, I feel completely Bengali. There are certain dishes that I can eat throughout my life, whether it is bhaja moong’er dal with rice, simple begun bhaja, or just regular home-made maachher jhol and rice” . Handling four pubs and restaurants in Bengaluru – namely Sway, Rewind, 3rd Innings, Cirrus and Republk – chef Gurudath completed his masters in culinary arts from Le Cordon Bleu, Sydney, Australia. According to an interview with Events High, the young chef believes that the mantra for a successful eatery is an amalgamation of six factors – market availability, seasonal produce, price of ingredients, balance of nutrition, location of the outlet, taste and colour of food. Specialising mainly in modern Australian, Mediterranean, Spanish, and Greek cuisines, Gurudath’s favourite recipes are biryani and slow-cooked pork belly. His unique method of preparation involves slow cooking, braising, and pan frying to enhance the texture and flavour of ingredients. When asked about the future, this Indian chef says that there are several plans – which includes opening outlets, restaurants, and gastrobars in various cities across the country. 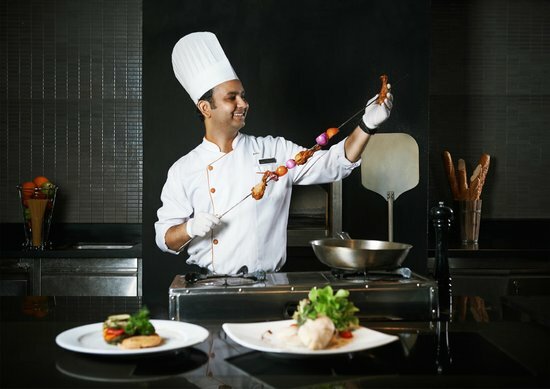 Bengaluru’s venue for lively music and budding musicians – BlueFROG – is also famous for its awesome menu of unmatched food and cocktails – with all credits going to its chef Vikas Pathak. After graduating from the hotel management college of I.A.M, he got a chance to work at Oberoi Kolkata through campus placement. Post training here as a kitchen professional, he landed an opportunity to learn about international cuisines at Cruise Lines, U.S.A. His eagerness to explore more into the world of food made him join BlueFROG. Experimenting with fusion cuisines, one of his specialties is Jamaican jerk chicken – prepared with chicken on bone, jerk sauce, oregano, chilli, vegetables, masala bread, and grilled pineapple pickle. Kopper Kadai in Bengaluru is known to serve modern renditions of heritage Indian delicacies. With recipes dating back to the 1930s, the innovative menu at KK has been created by the dynamic chef Akshay Nayyar. Taking inspiration from his grandmother’s kitchen, his favourite dish is mastava – slow-cooked pounded lamb and almond curry – which tastes best with the very special pankhuri roti. The recipe involves lamb chunks which are pot-sealed and cooked with almonds, lamb stock, whole spices, and chillies for 18 to 20 hours. It is then flavoured with saffron and mint. Emphasising on the quality of ingredients used, Akshay focuses completely on attitude, discipline, and work culture. Bengaluru’s heaven for chocolates – Jus’ Trufs – is the brainchild of Chenddyna Schae – an enterprising chef mom – who along with her husband and two sons set up this brand in 2001. Schae has been awarded certification from Bakery & Confectionery Catering College, Mumbai; Belgian Chocolate Masterclass, Barry Callebaut Institute, Singapore; and 10,000 Women – sponsored by Goldman Sachs and conducted by International School of Business (ISB), Hyderabad. She trained with Melt – a chocolate boutique in Notting Hill, London; and Herr Bulter, master chocolatier and baker from Netherlands. In 2009, Jus' Trufs also won the Best Business Plan award at ISB, Hyderabad. Her laurels can solely be credited to her fine art of making premium chocolates that are beautifully presented in elegant gift boxes and hampers. Another upcoming Indian chef who has made it to our list is Manisha Sharma – founder of The Spice Chef – set up in 2016. The company is a result of her immense love for spices, coupled with her fondness for cooking and experimentation in the kitchen. Expert in the art of finding and mixing the perfect combination of masalas – she is known to harbour a strong personality among relatives and friends. With a dream to empower women from the lower strata of society, her all-women initiative aims at delivering 100% homemade taste. Offering the true flavours of authentic home-cooked dishes, she aims at making her enterprise still bigger – to further empower the women that she employs. Harbouring a desire to be a chef since the age of 13, she had graduated from the Northern Alberta Institute of Technology’s world-renowned culinary arts program. Currently a resident of Bengaluru, her favourite Indian dishes include rasam, dal makhni, and her boyfriend’s grandmother’s tempting Goan sorpotel. Check out this video of the artist, hard at work – crafting a yummy guitar-shaped cake. Dhivya Pratik is an executive pastry Indian chef at The Park, Bengaluru. Not only is this innovative artist featured in several news channels and international magazines, she is a star in conducting regular cupcake, bread, and pastry workshops. Her favourite home food is the traditional pulihora rice aka tamarind rice, prepared by her grandmother in Tamil Nadu. The down-to-earth upcoming chef enjoys a cup of piping hot filter coffee after a hard day at work. Yes, we have finally come to an end of another story at SaleBhai Indian Chef Chronicles. Do you know of any other entrepreneur who holds a knack for capturing our palate with their exclusive recipes? If yes, do not forget to suggest some add ons!